You may have heard that I’ll be 50 soon (read about it here) because apparently I talk about it pretty damn often (and AGAIN, you can read about it here). Geez, you’d think I was obsessed or something. Ok, maybe I am, just a little. I’ve said many times that it doesn’t bother me that I’ll be turning 50 soon (in 197 days, 11 hours and 50 minutes…but really, who’s counting? ), but I have been thinking a lot more about it lately. 40 was really no big deal ~ I threw myself a party, had a cake that said “Happy Birthday to Me” and had a really good time with some great friends. I had started saying I was 40 in January of that year so by the time it rolled around, I was used to it. Everyone said turning the BIG 4-0 was the toughest, but honestly? Didn’t bother me at all. But the GREAT BIG GIGANTIC HONKIN’ 50? Now, that one….I gotta work on my mindset for that one. 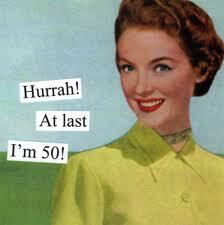 I’ll start saying “I’m 50” now, so I can get used to it! Half a century. Mid Life (only if I live to be 100!). AARP (dammit). Senior Citizen (close enough!). Oh yea…I totally need some new, hip, young, fascinating, fabulous, quirky, cool and chic labels. I’ll start working on those very soon. And with this looming milestone, I’ve written about my bucket list (link above – for the love of scooters, again? ), the fact that I’m totally gray but still wear lots of pink, and a letter to my younger self just in case all that crap about time travel turns out to be real. I’ve been thinking about decided that I want to get another tattoo…on my wrist so I can see it and be reminded of it every day. For those of you with multiple tattoos, you’re probably thinking “Big freakin’ deal…do it already!”. But this is a big deal to me so I want to make absolutely sure that what I get will be something I absolutely love ~ forever! So, I’ll create an album on my Facebook page, find really cool tattoos and put them there. I don’t want something too elaborate and I love girly stuff (you know, butterflies, flowers, fairy dust and swirls) so I’ll be looking for ones along those lines. Please join me in searching for my perfect tattoo ~ leave pics on my Facebook wall and tell me it’s my birthday tattoo idea from you ~ I can’t wait to see what you suggest! Previous Oh to say what we mean ~ how sweet the words! Next Anyone got any skills I can borrow? Oh, so true! So I’ll be aging backwards-cool! And yes! Please take pictures and let me see them ~ post them on my facebook page – yeah! And I love the flag behind the peace bird, sounds beautiful, as they all do. That sounds like an awesome idea! I have been wanting a new one for a while so I feel the urge too. My mom and I got tattoos last year, she turned 50 and I turned 25. It was a great experience. I will be on the lookout for you, along with all your other followers I’m sure. Can’t wait to see what you decide on! Thanks…and I’m already getting a little excited! I put some neat pics on my page already…check it out!